The practice of medicine involves inherent ambiguity, arising from limitations of knowledge, diagnostic problems, complexities of treatment and outcome and unpredictability of patient response. Research into doctors’ tolerance of ambiguity is hampered by poor conceptual clarity and inadequate measurement scales. We aimed to create and pilot a measurement scale for tolerance of ambiguity in medical students and junior doctors that addresses the limitations of existing scales. After defining tolerance of ambiguity, scale items were generated by literature review and expert consultation. Feedback on the draft scale was sought and incorporated. 411 medical students and 75 foundation doctors in Exeter, UK were asked to complete the scale. Psychometric analysis enabled further scale refinement and comparison of scale scores across subgroups. The pilot study achieved a 64 % response rate. The final 29 item version of the Tolerance of Ambiguity in Medical Students and Doctors (TAMSAD) scale had good internal reliability (Cronbach’s α 0.80). Tolerance of ambiguity was higher in foundation year 2 doctors than first, third and fourth year medical students (−5.23, P = 0.012; −5.98, P = 0.013; −4.62, P = 0.035, for each year group respectively). The TAMSAD scale offers a valid and reliable alternative to existing scales. 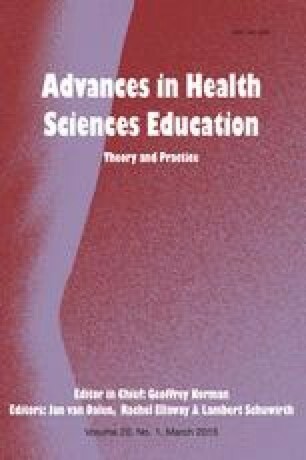 Further work is required in different settings and in longitudinal studies but this study offers intriguing provisional insights. We would like to thank everybody who contributed towards each stage of this study. Our eight medical education colleagues who contributed towards initial item creation, the ten medical students and foundation doctors in Exeter who took part in the initial study pilot and the medical students and foundation doctors in Exeter who completed the TAMSAD questionnaire. Lim, M. (2003). Who is being difficult? Addressing the determinants of difficult patient-physician relationships. Virtual Mentor, 5(4). Retrieved June 13, 2013, from http://virtualmentor.ama-assn.org/003/04/jdsc-0304.html. Royal College Psychiatrists. (2013). CT1 personal specification. Retrieved March 24, 2013, from; http://www.rcpsych.ac.uk/pdf/CT1%20Psych-person%20spec-August%202013-approved.pdf. TAMSAD recruitment video. Retrieved June 13, 2013, from; http://www.youtube.com/watch?v=uQEANkFzfq4&feature=youtu.be.